The artwork is inspired by the surrounding residential and natural landscape. 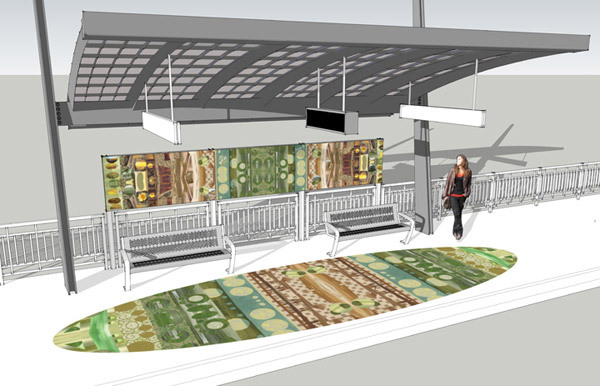 Karlsen approached the station platform as an outdoor living room, creating wallpaper-like enamel steel art panels alongside the platform seating areas, and glass and stone mosaic paving patterns designed to read like cozy ellipse-shaped area rugs. Art panel collages combine hand-painted and printed papers with vintage wallpaper in the colors of sunset, sky, desert flowers and multicolored rocks. Patterns are arranged in stratified layers that echo the rocks in the nearby hills. Interspersed within the highly textured collages are photographic images of local historic sites, area notables and native wildlife provided by the project's Art Advisory Group. Seen together, the art panel and paving designs are meant to bring a feeling of indoor suburban comfort to the outdoor, open air platform. "The painted layers loosely refer to the geologic stratification and formation of the rocks in the northwest San Fernando Valley. Starting on the edges, the colors and forms refer to the sun, the sunset, the colors of the desert flowers and multicolored rocks. As the panel moves to the center the colors slowly morph into those of the sky, sage, scrub and trees." ANNE MARIE KARLSEN received a B.F.A. from Michigan State University and an M.F.A. from the University of Wisconsin. Her work has been featured in exhibitions throughout the United States including the Museum of Fine Arts in Boston, the UCLA Armand Hammer Museum in Los Angeles, the Brooklyn Museum in New York, and the Carnegie Institute Museum of Art in Pittsburgh. Karlsen has completed numerous commissions for libraries, transit stations, cruise lines and municipal buildings. Her public art projects have been recognized as some of the most successful in the United States by the Americans for the Arts Year in Review. Karlsen received the Westside Prize by the Westside Urban Forum for her work on the Santa Monica Boulevard Master Plan for the City of West Hollywood. She teaches at Santa Monica College.